I can safely say that I adored Nocturne for a Widow. Amanda has a way of transforming such morbid events into an amusing tale. The first chapter with the eccentric Etherton and his drama drew me in and the following events continued to demand my attention. I loved Sybil's theatrics and her stubborn but loyal character. Her restless energy and love for her profession was a lovely change from all the books about teenage protagonists I've read recently. Mr Brooke certainly completed the picture with his cynical attitude and devilish persona. It was clear from the start that Sybil and he would make a fierce couple, especially since the two were at war for ownership of the house. They keep each other at arms length and argued incessantly but the energy between them was palpable. There were many other unusual characters to this story, such as the witty reverend, malicious Mrs Dove and the spirit haunting the mansion. In conclusion, this book was a delight to read, as Amaanda DeWees' books always are and I do hope you'll give it a try too. 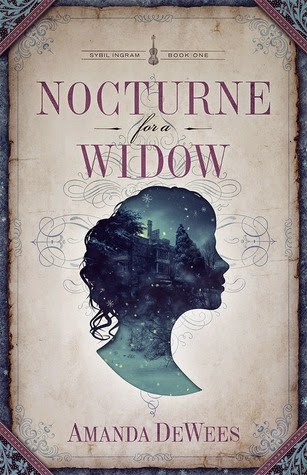 If I haven't convinced you yet, take a look at my favourite quotes for a taste of Nocturne for a Widow. No longer was I confined to the purgatory of solitude waiting. She who has an enemy, after all, is never lonely. I like the sound of this book a lot! I hadn't heard of it before.